After eight consecutive sessions of price gains, crude prices are down $.34 (.68%) to $49.83, after closing the session yesterday above $50 for the first time since May. Prices opened this morning at $50.21, 4 cents higher than yesterday’s close of $50.17, but have fallen amid lack of news to push the market higher. Refined products are also down this morning, with diesel prices shedding 1.36 cents (.82%) and gasoline losing 1.22 cents (.73%) from their close yesterday. Gasoline and diesel prices both fell and rose yesterday to remain mostly flat overall. 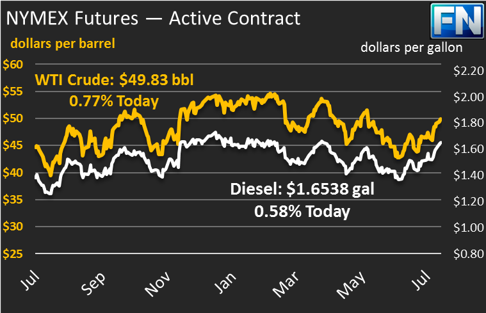 After posting solid gains leading up to the close, gasoline prices fell as August futures prices expired. The market has been backwardated (meaning future prices were lower than current spot prices), so when the August contract expired, prices rolled over to September’s lower price. 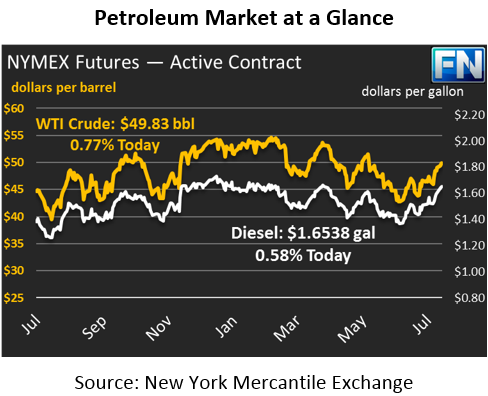 Remember that NYMEX prices are always delivered in the future – the NYMEX contract traded during August is due for delivery on the business day before Sept ‘17. Markets are focused this week on Libya and Venezuela. Libya has raised its crude output significantly, so much so that OPEC’s July production rose despite reduced exports from Angola and Saudi Arabia. Remember that Libya is not a party to the OPEC cuts, so they can produce as much as they need. They recently agreed to a production cap well above their current production, which does not provide much comfort to the market. Sanctions against Venezuela’s oil sector are pressuring prices higher. Yesterday, the U.S. Treasury announced sanctions against President Maduro, freezing his assets in the U.S. and banning U.S. individuals and corporations from doing business with him. Markets continue to wait to see if oil sanctions will be used by the Trump administration to put pressure on Venezuela. Goldman Sachs reported yesterday that sanctions likely would not have a major impact on global oil prices, but they could put pressure on U.S. consumers who would have to find a new supplier to replace that crude oil.